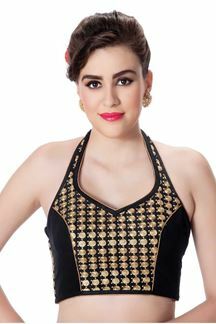 Grace any evening party with this classic black designer halter neck blouse featuring classy spiral motifs zari embellishments all over the front while the side panels are plain in immense charm. Don with royal blue lehenga and pink dupatta for a regal look! Note: Color may slightly vary due to digital photography.